Nilufur is a young woman living in a village near the border between Tajikistan and Uzbekistan. She works an assistant to Kirill, the Russian operator of a climate observatory on a hill who has trained her in meteorological instruments and observations, such as the exact calculation of true noon. Long separated by his family, Kirill is an old man and wants to go home but no replacement has been sent yet. He thus decides to transfer his responsibility to Nilufar after her marriage with Aziz of the next village. But on the day of the engagement, soldiers plant barbed wire and mines to separate the two villages. The life of the people, who have thus far enjoyed peace, now falls into severe chaos. The first film to be produced by the Tajik film industry in 18 years, True Noon explores the consequences of the dissolution of the Soviet state, and the arbitrary nature of a government's relationship with its citizens. Tajik filmmaker Nosir Saidov's feature film debut is both politically dense and lined with absurdist humor, deconstructing modern notions of borders, nationalism, time, history, and community. True Noon premiered at Rotterdam, Marrakech and Santa Barbara, and won the Audience Award at both Busan and Kerala. Which way forward, and how to view the colonial past? While Nosir Saidov's debut feature engages thematically with Russian influence and the conflict between tradition and modern life, True Noon rejects easy answers. "Saidov makes his point even more vivid by keeping things matter-of-fact and occasionally comical. The villagers don't let civics interfere with their lives at first, and just mosey up to the fence and haggle with each other from opposite sides. But Nilufar's wedding brings just how serious the issue is into sharp relief. True Noon never considers nationalism a problem for its characters; with the exception of Kirill, everyone is from Safedobi and that's how they identify. What the film does consider is the hand centralized, distant bureaucracies have in creating nationalism and how fundamentally fragile our social connections are"
"A beguiling balance of folksy sensibilities and tight plotting, True Noon spins an appealing yarn about a Russian emigre's life in a village in Tajikstan. Made with the assistance of Rotterdam's Hubert Bals fund, this charismatic effort eschews that funding body's predilection for digital technology and offers a warm... 35mm experience. 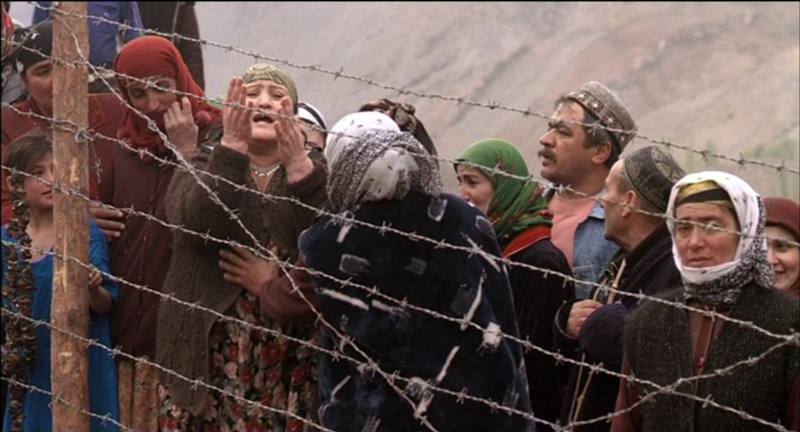 Allegedly based on the division of Tajikistan from Uzbekistan in the wake of the Soviet collapse, the effortlessly charming script has a whiff of Powell & Pressburger’s easy magic as the villagers work around the comical (and sometimes deadly) implications of the Russian-imposed problem"